The Building Industry and Land Development Association recently posted the following article explaining the two radically different new construction markets in the GTA, the high-rise and low-rise markets. “The GTA’s tale of two markets was even more prevalent in the tally of new home sales in January 2013, the Building Industry and Land Development Association announced. In the high-rise market, new home buyers are still looking for and finding quality, affordable homes across the GTA. Choice in the high-rise market is a direct result of provincial public policy which has resulted in an ever increasing emphasis on intensification, and the industry is adapting to the shift. 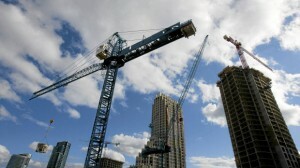 In January, new home buyers purchased 686 high-rise homes, most of which were sold in the City of Toronto. Buyers interested in owning a new condominium in the 905 found a variety of projects in York Region as well. The tale of the low-rise market is illustrated by constrained land supply and a lack of product and choice. According to RealNet Canada Inc., BILD’s official source of new home market intelligence, new home buyers purchased 562 single, semi-detached and townhomes in the GTA.